So I plunked down my money and asked my question, “What should I do with my life?” At the time I was in a period of transition, between jobs and needing some inspiration. She shuffled the cards, pulled three, and pondered them for a minute. When she looked up at me she said, “It doesn’t matter what you do, just do something.” Then she shrugged as if to say, what did you expect for $5.00, the true meaning of life? But that $5.00 turned out to be a pretty decent investment because it did give me the wisdom I needed. We all know somebody, maybe even ourselves, who has gone through a stretch of stagnation in their lives. 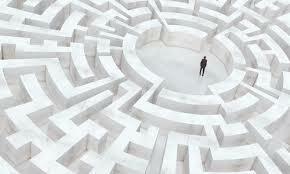 Stifled by the inability to choose the next step, they are stuck. Really good ideas hold no allure and the more they come up with, the more confused they become. The only way to get out of this kind of self imposed rut is to do something. Doing nothing can easily become a habit. Daily routines fill our time with familiar activities. In order to move forward in our lives we need to break that routine by doing something….something different. It doesn’t have to be anything life altering. You are not required to pull up stakes and move across country. Just something that will break the energy swirling around you that is acting like a straight jacket. Join a group, take a class, visit a town close by, anything where you might meet new people or learn new things with a different perspective from what you have right now. The purpose is to break the thought patterns that are acting like a broken record in your subconscious mind, stuck on the same song. It does not matter if what you learn doesn’t become your new passion. It does not matter if the people you meet don’t become life long friends. What matters is that you did something. With any luck, whatever that something different was will break the stasis you have found yourself in. If it doesn’t, do something else. Eventually the loop of old, stagnant thoughts that have circled around your life will straighten out into a fresh new pathway. I’ll bet that the Tarot card reader that gave me this message all those years ago felt I didn’t get what she was trying to say to me. Maybe she didn’t get it herself, but that $5.00 piece of advise has served me well since. Whenever I am stuck on what to do next and can’t get past where I am, I go back to this tip and do something, anything, as long as its different from what I’ve currently been doing. It usually works and I get my thoughts flowing again with new energy strong enough to snap the old mental recordings playing on repeat in my head. Sounds like good advice…..lucky for me it was free! 🙂 Have a great day..